Henry Labouchere's ancestors were Huguenots who fled from France to Holland. His grandfather came to England and married the daughter of Sir Francis Baring. Labouchere's father was a banker who married Mary du Pré. Henry was their eldest child. He was educated at Eton and Trinity College Cambridge. A radical, an agnostic, and a rebel, he took several gap years off in wandering around Latin America, joined a circus, and spent six months in a camp of Chippeway Indians. His family then got him a place in the diplomatic service in which he served for some ten years. Appointed to a post in Buenos Aires, he accepted on condition he remained where he was in Baden Baden. The jest led to his dismissal. 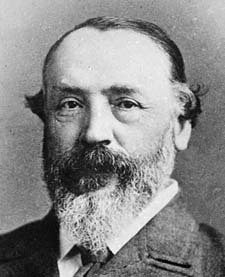 He then became a journalist and an M P, supporting Gladstone over Home Rule for Ireland but privately mocking his fervour. Gladstone's tendency to keep an 'ace of trumps' up his sleeve, Labouchere found acceptable. But why did he have to pretend that God had put it there? 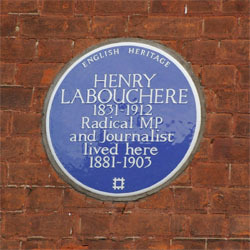 Blue Plaque on Pope's Villa, Labouchere's weekend retreat. Weekend retreatAfter a long relationship Labouchere married the actress Henrietta Hodson (her first husband's name was Pigeon) in 1887, and he supported her theatrical enterprises. In about 1880 the couple had acquired the rebuilt Pope's Villa as a weekend retreat from London. Lillie Langtry rehearses at Pope's VillaIn 1881 the Laboucheres persuaded the young Lillie Langtry to join with Henrietta in a one act play, to be performed at the local Twickenham town hall as curtain raiser to a drama called “Plot and Passion”. It was to be a one night show, but rehearsals for “A Fair Encounter” in which Lillie Langtry was to play Lady Clara took some two weeks. She was not helped by “Labby” making caustic remarks. Henrietta's next efforts to make an actress out of Lillie, led to endless rehearsals on the Pope's Villa lawn of ”She stoops to Conquer” with Henrietta playing all the other parts to her ”Kate Hardcastle”. This eventually came to an end with ”Labby” commenting that "a flock of sheep couldn't have played more havoc with his lawn”.Braves, squaws and babies entertained grandlyAnother 'theatrical' event was the visit of Buffalo Bill's Circus to England in the Jubilee year of 1887. The Laboucheres, having seen the Circus in London, invited all the Indians to lunch in Twickenham. The Indian braves, squaws, and babies all in costume, arrived not at 2pm as expected, but at 10am on a Sunday morning. Whilst waiting for the steam launch which was to take them up to Hampton Court Palace, Labouchere showed them his garden and invited them to help themselves to the gooseberries and red currants. Soon all the bushes were stripped bare. At Hampton Court, shown the Maze, they passed through in record time, not realising it was a Maze. A grand dinner followed on their return to Pope's Villa. The roast beef was very popular and a few peas were eaten, with tea and coffee, but the plum pudding ended up in each Indian's belt-bag which already contained gooseberries, grapes, biscuits, cigarettes and cake. Borough of Twickenham Local History Society Newsletter No.86.